Like every other sailor attempting this passage, I was unable in 2018 to go through the North West Passage. I tried as hard as possible not to deceive you and to sail around my personal « Himalaya ». Nature had other plans for us this year. I want to thank you all for your help and your support. 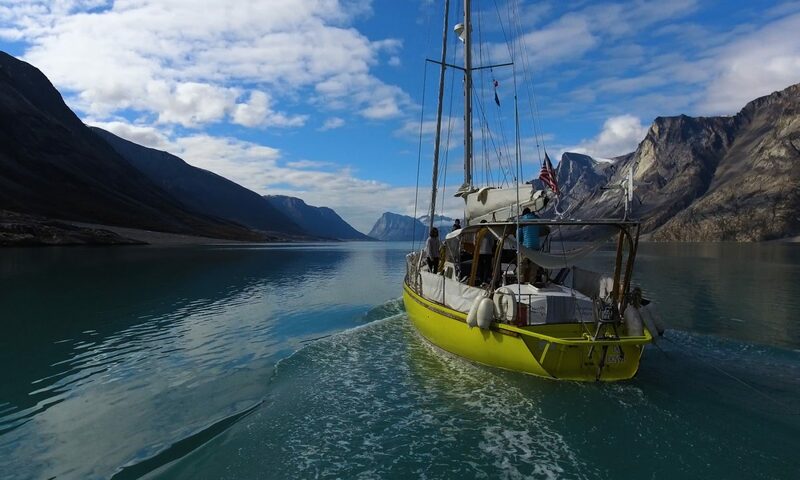 You alone made possible this extraordinary sailing journey through the Arctic. My first thanks go to Patagonia my main and reliable sponsor. They share my rugged sailing philosophy. I join their fight eagerly “to make the planet great again” for those coming after us. From the austral region around Patagonia to the North West Passage in the Arctic, with these two opposite polar destinations, PATAGONIA had only one goal : keeping us dry, warm and comfortable in those frigid latitudes. They have a long expertise in this field. Their specialized engineered clothes protected us from the rigors of northern sailing. One of their wet-suit was a life saving equipment for us. Thanks to it, one of my valiant crew dived into icy water, under my boat, saving my propeller and our journey. Without PATAGONIA this expedition would not have been possible. A special thanks to Chris Gaggia, our main contact with Patagonia, since the beginning of this project. To him, to them all, many many thanks from my crew and from myself. Bill and Sue with Sunrise coffee, Thanks for the wonderful coffee and useful tools. Filson… click on picture to discover more about this wonderful outdoor company.. Thanks also to FILSON, our West Coast outdoor company and particularly Brian Fisher for their support. Bob with Admiral supply, with all the helpful supply. Thanks Bob ! Rob from Chimacum Corner Store. Thanks for all the delicious food. You kept all the sails and dodger in good shape and worked hard to keep Breskell in shipshape condition. Big thanks to Walt Trisdale for all his unbelievable help. Of course, thank you to all at North West School of Wooden Boat Building for your help and your support. Give me also the opportunity to warmly thank my crew, my wonderful crew. Eric for being with me during all these three months. He brought to Breskell his wonderful technical abilities, his vast knowledge, his courage and his hard work. Eric, my “navy seal in training “ , my diver in frigid water and mast climber in stormy weather. Thanks Eric. Thank Joe and Dom for your dedicated engagement, your beautiful pictures and your award-winning movies. I am anxious to present your next video “Breskell” to our followers. Another award movie, I am sure. Thanks Shannon for your smile, your good humor and your daily help. Thanks, Shannon, for your warm smile and good humor.. Very special thanks to Damien. You were a fantastic router. And my personal and fantastic router in the middle of the Arctic ice.. Your precious information made possible a trip without any serious mishaps that far north. I like also to thank all you , close friends, friends known or unknown and every other supporters here in the US, or elsewhere in France, England, Switzerland, New Zealand. Many thanks to all of you writing your support on my blog mostly in English, some in French other even in German ! Behind the curtains of my blog, a few other shadows opted to hide in the fog of the cyberspace. Webmaster(Jean Rene), corrector (Louise ), cartographer (Sergio).. Behind the curtain of my blog… a few shadows in the fog of the cyberspace… webmaster, corrector,cartographer. I will never show enough gratitude for the support you provided to me and my crew… I can’t name everyone here. Your name IS on “Breskell” and in our HEART. You sailed ALL with us. A last word. Can you believe that: a long time ago, Jacques and Marie-Paule Fetis with the” SECODI” Society in France provide me with a Perkins. My trustworthy engine, the faithful partner of my cold molded wood epoxy “Breskell”. So long ago, in the years 1985, 1986, when I was building my boat bare handed. I will remember their help forever. thank you, Jacques, Thank you Marie- Paule. THANKS YOU SO MUCH TO ALL OF YOU…. and see you next year mommy bear ( picture Dominic and Joe)…take good care of your cub. I WILL DO MY BEST TO HELP YOU !